Be a Brawsome V.I.P. at PAX! | Brawsome!Brawsome! Be a Brawsome V.I.P. at PAX! It’s been a while since the last update, partly because the news I DO have I can’t talk about yet, and partly because I don’t have any new news I CAN talk about. Until now! 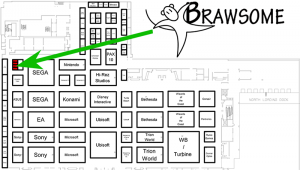 You may have deduced from the not-so-cryptic headline that Brawsome is going to be in the home of Microsoft, Starbucks and Valve for PAX this year. This will be the second time attending the overwhelming nerd love-in that is PAX, but the first time actually exhibiting. I wouldn’t say we’re in a big booth, not quite medium either, and calling it small would be too generous. Let’s just say if you were at Starbucks ordering a Short, Tall or Grande Latte, we would be the Demi size that no-one knows about, or maybe the sugar. Nevertheless! We say we’re the smallest house in the best street. Location, location! Check out our neighbors, SEGA, EA, Sony, Nintendo. You know, the usual crowd. 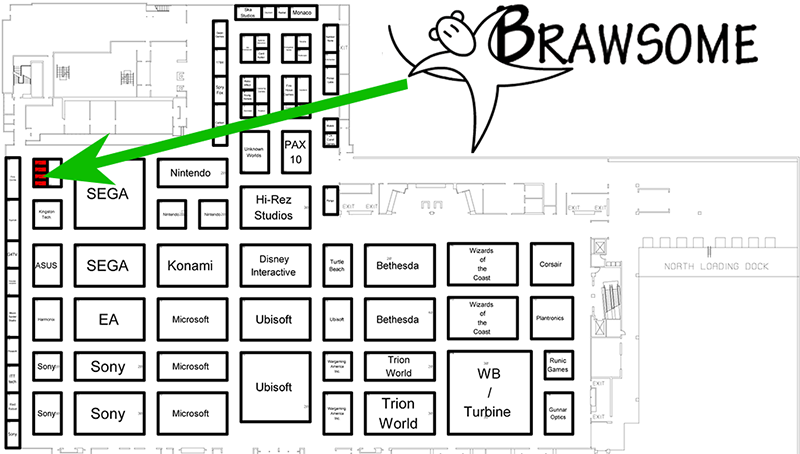 Now, if you want to come to PAX to see Brawsome, well, it’s probably (definitely) WAAAY too late for that. All 60,000 or so tickets tend to sell out in a few days, several months before the expo. I wouldn’t be surprised if they put tickets on sale for the next 5 years of PAX and they sold out in a week. But if you managed to snag a ticket to PAX, or find some way to sneak in dressed as an Orc, or some Manga character I’ve never heard of, then stroll up to Booth 158 (pictured above, but not even CSI could enhance that text) and have a chat to us. We’ll likely fire a limited edition V.I.P. card at you for either Jolly Rover or MacGuffin’s Curse, containing a Humble Store code for your very own copy! Well, additional copy, you’ve already purchased it, right? We thought about selling copies there, but I’d have to pretend I was from the SEGA booth, and it was for something Sonic related (which I’ll no-doubt try anyway). We’ll also have some neat postcards to give away, and copies of the game on display for all to play. If you can’t make it to PAX, you can still get in on the Brawsome action with the sale that will be running during the conference. On Steam, there will be a Brawsome bundle, featuring MacGuffin’s Curse and Jolly Rover for $6.99, and MacGuffin’s Curse will also be 50% off on the App and Mac App Stores. Now, there’s some super secret information about a project Brawsome is working on with some awesome designers that have been relatively dormant for a while. The information was leaked recently, and is out there for anyone who is looking in the right place. But you’ll not find any more about it here until the time is right. There’s a little project for you. I do all the boring stuff that's gotta be done so I get to do fun stuff sometimes. One Response to Be a Brawsome V.I.P. at PAX! Due to Jolly Roger being such a load of fun, I bought McGuffin’s Curse out of prpicinal to support the talented devs. Heck at only $3.99 why not? Cheaper than a coffee and I’m sure it’ll keep me up longer As an aside Andrew I think I may have worked with you at DSTO Fisherman’s Bend back in the 90s! Keep up the good work and living the dream mate!